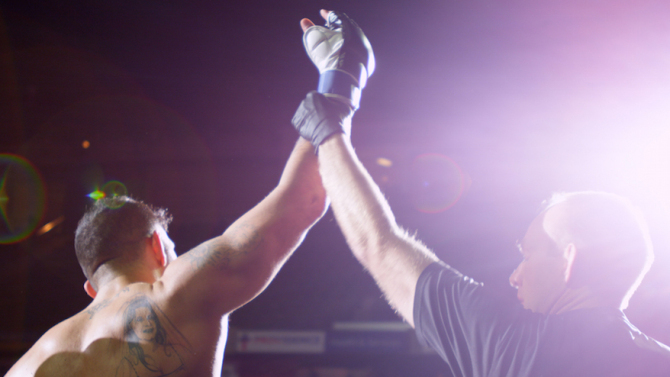 THE CAGE FIGHTER is a deeply engaging but frustratingly problematic film from director Jeff Unay. As I watched it I thought it was a compelling lo-fi drama along the lines of THE WRESTLER. Joe Carman is a charismatic gentle giant with a loving family who want him to give up fighting Mixed Martial Arts because of its clear toll on his health and the fact that it takes him away from his sick wife. But he seems to be motivated by the need to prove himself against a younger upcoming fighter, up until the point that he meets him in real life and realises that he's just mortal. As I was watching it I admired the depiction of a good but conflicted family man, and the movie's willingness to subvert the classic underdog sports story ending. But when the lights came up and the director came on stage it became clear that he viewed this film as a documentary and that the film we had seen on screen was an actual family. This was something of a shock because to my eye, it felt like a lot of the scenes had been staged. For interest, one in which the director follows the fighter's daughters to a car lot and they express their concern about their father's fighting. So in retrospect, what seems to be happening here is that we're watching some kind of documentary where key scenes have been re-staged. The Q&A also raised questions about objectivity. It was clear that the director and star are close friends and that their families have spent a lot of time with each other. I guess my concerns don't invalidate the good time I had watching the film - they just left a bad taste in my mouth. They raised provocative questions about how we classify a documentary and what burdens are or should be placed on the film-maker to speak to just where the reality/fiction line has been drawn. From my perspective, as good as this film is, I would hate to see it enveloped in the kind of controversy that affected CATFISH and I would hope that the marketing campaign addresses these concerns directly to avoid that. THE CAGE FIGHTER has a running time of 83 minutes and is not yet rated and does not yet have a commercial released date. Sure - let me know how to contact you. Eager to understand the process and intent here as I greatly enjoyed the film.